When a Harvard biologist announced biological aging had been reversed in just one week by the use of a compound that invigorates energy-producing compartments called mitochondria inside living cells, the news was spread worldwide. But the bottom line lesson from this landmark study was to wait a few years for Big Pharma to develop an expensive prescription drug to duplicate this unprecedented experiment. And indeed, the results of the experiment were extraordinary – the muscle tissue in an aged (22-month old) laboratory mouse reverted back to a more youthful state in just one week, equivalent to turning a 60-year old human back to being 20 again! (A technical abstract of the report is published at the journal CELL.) Now if we could only erase those wrinkles! Does humanity have to hold its breath? Does humanity have to wait to put this discovery into practice? Maybe not. The molecule by which researchers activated failing mitochondria in aged cells was niacin (vitamin B3) derivative known as nicotinamide mononucleotide (NMN). While NMN is only available experimentally at $1000-2000 per gram (per 1000 milligrams, or $1-2 per milligram), its molecular precursor nicotinamine riboside has been synthetically produced and has recently become available as a branded dietary supplement under the trade name Niagen (ChromaDex). A month’s supply of 250-milligram capsules (500 mg suggested serving size or 2 capsules/day) sells for about $50 a bottle. The problem is the Harvard-based laboratory that conducted this breakthrough study employed 500 milligrams of NMN for every 2.2-lbs (1 kilogram) of body weight. That would come to 35,000 milligrams/day (140 pills a day). Using nicotinamide riboside (Niagen) instead of the unavailable NMN would cost $117/day. NMN would cost $43,000/day according to news reports. Yikes! That’s not to say there are no health benefits derived from lower-dose nicotinamide riboside but may not the demonstrably rapid age reversal achieved in the animal lab. NADH dietary supplements are also widely available (NADH stands for “nicotinamide adenine dinucleotide (NAD) + hydrogen (H).”) but are provided in low-dose pills ranging from 5 to 25 milligrams. NADH is primarily touted for use as a remedy for chronic fatigue. NADH pills cost 50¢ to $1.00 each at retail prices. There is also niacin itself, requires high doses and produces the well known “niacin flush” (a beet-red flushing of the skin) that is generally undesirable. Niacin has generally been used for cholesterol reduction but has lost some of its earlier luster as it failed to show benefit in two human studies. Combined use with apple pectin is reported to reduce niacin flushing. Slow release niacin pills are widely used to reduce flushing but are not as biologically available as plain niacin. Niacinamide eliminates the flushing problem. With advancing age living cells produce less cellular energy. Small compartments within living cells is where cellular energy is created. Only about 4% of the mitochondria are functioning in humans by age 80. The energy currency in the mitochondria is adenotriphosphate (ATP). NAD (nicotinamide adenine dinucleotide) is a protein that must be produced to regulate electrons inside the hundreds of intracellular mitochondria that produce ATP. (View a simple 1-minute animation that shows how NAD is required to pass along electrons inside mitochondria. A more complicated explanation is also available for viewing online.) Simply said, raise NAD levels and cell energy (ATP) will increase. What happens as aging progresses is that living cells begin to convert to solely using sugar rather than oxygen and sugar (glycolysis) to produce ATP. (An animated demonstration of how oxygen is utilized to produce cellular energy is available for viewing online.) This is also called cellular respiration. The conversion to glycolysis with advancing age is a characteristic of cancer cells that solely rely upon sugar to produce cell energy (called the Warburg effect for Otto Warburg who discovered this in the 1930s). What the Harvard researchers demonstrated in the lab is that a gene that is involved in creating an oxygen-starved state in living cell (called anaerobic metabolism), the hypoxia inducing-1 gene (HIF-1), is activated to create “pseudo hypoxia,” a false signal of oxygen deprivation. The removal of a survival gene known as Sirtuin1 results in an increase in HIF-1 gene proteins, meaning proper functioning of Sirtuin1 is required to keep HIF-1 in check. A calorie-restricted diet (40-50% less calories) completely blocks the increase in HIF-1 and counters the loss of NAD and ATP (cell energy) that characteristically occurs in older mice in the laboratory. Is there a molecular way to do this without food deprivation? Treatment with the niacin derivative NMN increased NAD and reversed the accumulation of HIF1. The leg muscle (gastrocnemius) of older mice reverted back to utilization of oxygen as an energy source with the provision of NMN. The effect was rapid and profound. The biochemical markers in a 22-month old mouse reverted to levels found in a 6-month old animal in just one week! However, two other ways to achieve the same effect have been demonstrated. 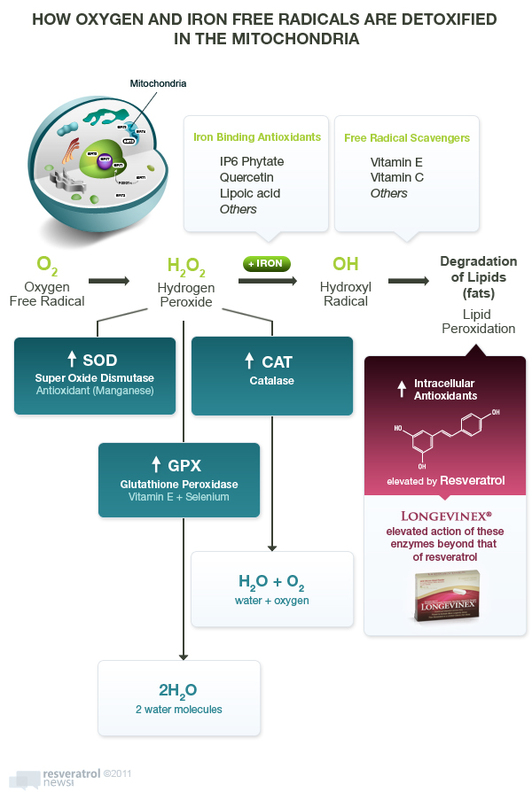 While resveratrol modestly inhibited HIF-1, Longevinex® exerted profoundly stronger inhibition. This is far greater HIF-1 inhibition than could be produced by use of niacin derivatives. Second, among seven Sirtuin survival genes, Sirtuin3 operates in the mitochondria where cell energy is produced, whereas Sirtuin1, the gene extolled by Harvard investigators, resides mainly in the cell nucleus. 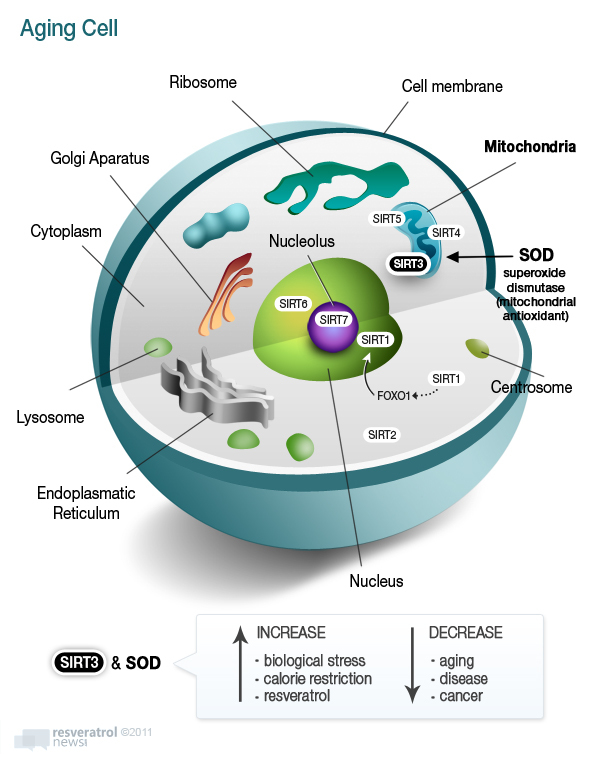 While Sirtuin1 has been shown to exhibit a robust life-prolonging effect in yeast cells, fruit flies and roundworms, it is Sirtuin3 that has been demonstrated to overcome aging in the mitochondrial cell energy compartments. It is Sirtuin3 that has been confirmed as a gene associated with longevity in humans. In this regard, the red wine molecule resveratrol, and more so Longevinex®, have been shown to activate Sirtuin3 gene activity. In the animal lab Longevinex® has demonstrated superior ability to influence the same biological mechanisms shown recently by researchers to reverse biological aging, and to do so in a more available and affordable manner.